The concept is to cultivate pond/marginal plants and allow them to grow above the water with emersed leaves and flowers, while at the same time creating a self-sustaining aquatic ecosystem in the water. For this particular setup, there is no substrate used and the plants are not potted in soil, they are all simply tied to pieces of wood, this makes it easy to move them around anytime without creating a mess. All the plants used were chosen based on their fast growth characteristics and ability to grow without soil. When such plants are grown in a soil-less hydro-culture method, the plant roots adapt to drawing nutrients directly from the water column, thereby cleaning the water more efficiently than if they were potted in soil. There is no filter as i don't have an electrical point at the balcony area, so i'll have to rely on a higher plant density to perform the bulk of the natural filtration. I also decided to use a solar powered pump with a fountain head to provide abit of circulation and surface agitation during daylight hours. Due to the filter-less setup, i maintained a very low bio-load by just adding a few Boraras Brigittae to help eat up any mosquito larvae or bugs that may breed in the water, and a group of Neocaridina Heteropoda as plant cleaning/algae management crew. During this initial period before the water garden's ecosystem is fully established, the fauna are fed very lightly twice a week to maintain a balance in water quality and nutrients for the plants. Once the ecosystem is mature, there will be much less feedings required. I'm currently trying out a small solar powered pump which operates when there is sunlight (there is no battery storage capability in this model, but i may upgrade it soon). As this solar panel didn't come with a mount, i just used an acrylic A4 stand to prop it up at the right angle to catch the sunlight, along with some clips to help secure the attached cord to the pump. 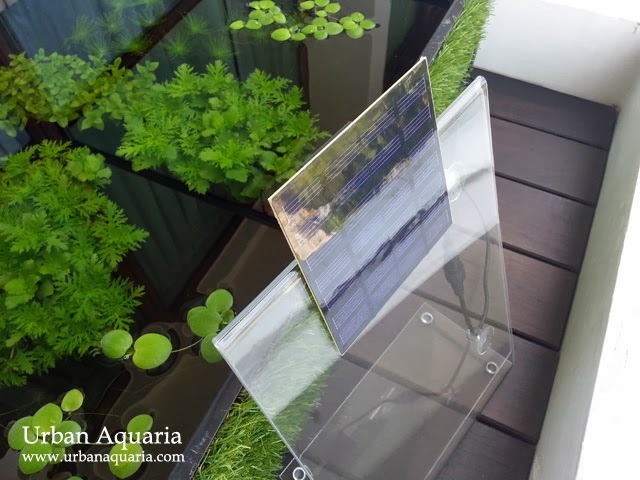 The solar pump is rated at 180 l/ph, but in reality the actual flow rate depends on the amount of sunlight that the solar panel receives. As the balcony is somewhat shaded, it only gets partial sunlight so the flow tends to be more of a trickle. Its still good enough to provide some gentle surface agitation and abit of ripple effect though, which helps reduce the buildup of surface film. I've tried placing the solar panel under direct sunlight on a clear bright sunny day and the pump flows faster with more water height, but due to my balcony placement i can't mount it that far outside, so i'll just have to work with the lower water flow. One factor that i noticed in an outdoor balcony pond setup is the much wider fluctuations in water temperature (compared to indoor tanks), in the day the water temperature averages around 29-30°C... but at night it can drop to as low as 25-26°C, which i guess is due to the direct exposure to much cooler outdoor temperatures. Plant-wise, i was expecting slow growth since there isn't any fertilization or Co2 injection... but it seems the combination of naturally fast growing pond/marginal plants and natural sunlight was enough to encourage surprisingly fast and healthy growth. An example is the Ludwigia Repens that i added recently, it took less than a week for the bunches to grow up and above the water line. Here is a photo of Cyperus Haspan, most aquarium keepers buy these from shops and add them into their tanks because they like the unique look of it, but its actually a pond/marginal plant. 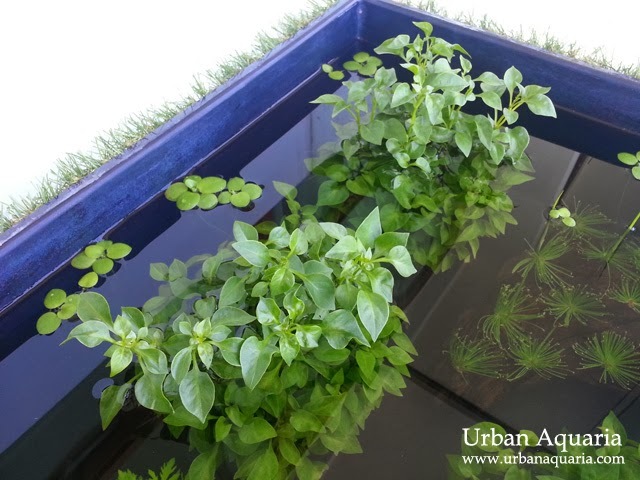 These plants will naturally grow long stalks up to 3ft above the water and sprout emersed leaves and flowers. Some of them have already begun to send up stalks in the above photo. hi, chanced upon your blog and its all very nice. obviously you have quite some technical knowledge and experience with aquatic plants. if its ok, I would like to have your thoughts/suggestions on a project of mine? I have a pond that's about 50cm deep. and I would like to add some aquatic plants to act as filters other than just having the mechanical pump/filter. but I would like to avoid those planted in pots of soil because they tend to smell bad and get messy after some time. Many aquarium plants can be grown just tied to mesh, wood or rocks without the need for soil. Just shop at various aquarium shops to find plants for sale which are already tied to objects, that is an indication those plants can grow without soil. For the fast growing plants which can help soak up excess nutrients from the water column, you can look at water wisteria, water sprite, the various rotala and barcopa plants, parrots feather, hornwort etc. Majority of those plants are rated as fast growing low demand plants on aquarium websites. Since your pond is 50cm deep, you may need to raise the plants closer to the water surface so that they can obtain sufficient light to grow (depending on the amount of light the pond receives during the day). You can use plant pots placed upside down or perhaps DIY some plastic grates to create shelves in order to raise up the plants. 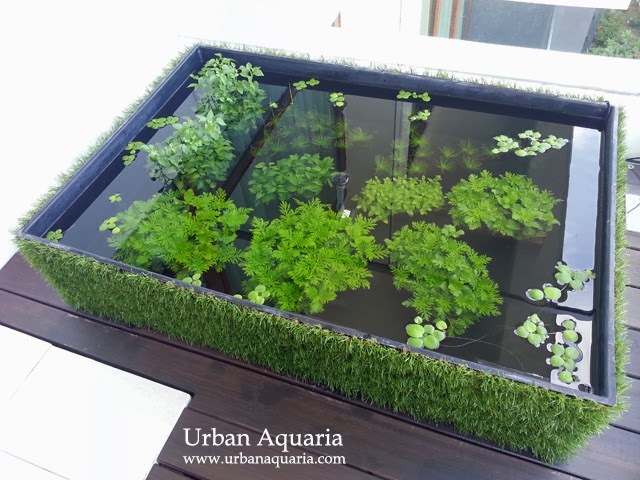 Common floating plants like frogbits, water lettuce, water hyacinths etc are also excellent for soaking up nutrients from the water (they are actually the best choices for such tasks), and as they grow above the water, they have full access to light and Co2, without getting affected by algae issues. As for water hyacinth, I heard about the tendency that it's roots rotting quite easily? And also, the part of the 'pond' I am thinking of placing the plants is actually situated higher than the main pond. Hence there will be a drop and waterfall effect. So I am thinking that floating plants may not be such a good idea as it maybe washed over, into the main pond. This is a little hard to describe and I am probably asking too much, but do you reckon if you are opened if I take some pictures and send it over to you for a more detailed 'consultation'? Sure, you are welcomed to post some photo links to your setup and i can have a look at its layout. 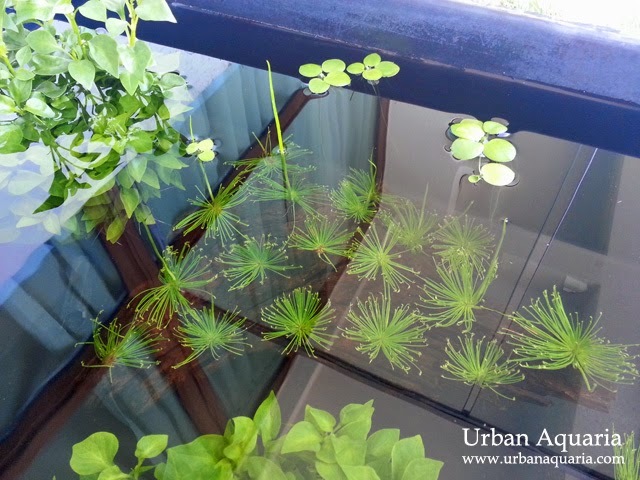 Btw, you can still put floating plants in the small pond, just corral them together with a floating ring or DIY loop of hose so that they stay in one position and wouldn't drift around or get washed down into the main pond. Could you share where did you purchase the fibreglass tank? Back to my initial question. How's the Cyperus Haspan? Are they tie to wood or coconut? They have a sea urchin look to me.... Kinda of hard to resist. The Cyperus Haspan plants in my setup are simply slotted into holes drilled into the wood, they can also be tied onto other objects or planted in soil too. A relatively easy plant to grow, just need to supply it with ample light and nutrients. Note that the green clusters or "crowns" you see in the photos are actually the emersed leaves/flowers, they are propagated by cutting off the emersed crowns and replanting them underwater, then new stems will grow out of the water and develop more new crowns again.